The Search for Intelligence Life on Earth: White UFO Researcher Resigns for Noticing 'White Genocide"
The Mutual UFO Network, or MUFON, is an all-volunteer organization dedicated to investigating unidentified flying objects (UFOs) in all 50 states and more than 40 countries through a decentralized network of state chapters and local field investigators. 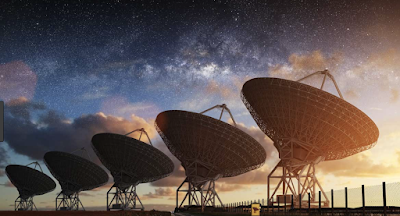 While the organization’s mission is promoting UFO research and discovering “the true nature of the phenomenon,” the most hoped for scenario is, of course, extraterrestrial first contact (unless government Disclosure comes first). Why search for intelligent life in the heavens when such little evidence exists for it on earth? Imagine an alien race finally comes to Earth and this is the man they meet. That’s John Ventre. He was, until recently, MUFON State Director for Pennsylvania and oversaw field investigations of the most compelling of the state’s approximately 600 annual UFO sightings. You may have seen him on History Channel's UFO Hunters or Anderson Live. Ventre wrote this on his personal Facebook page in response to a post from a popular alt-right account characterizing Netflix’s Dear White People as promoting “white genocide.” He railed against affirmative action and interracial couples. “Everything this world is was created by Europeans and Americans,” Ventre said in the post. 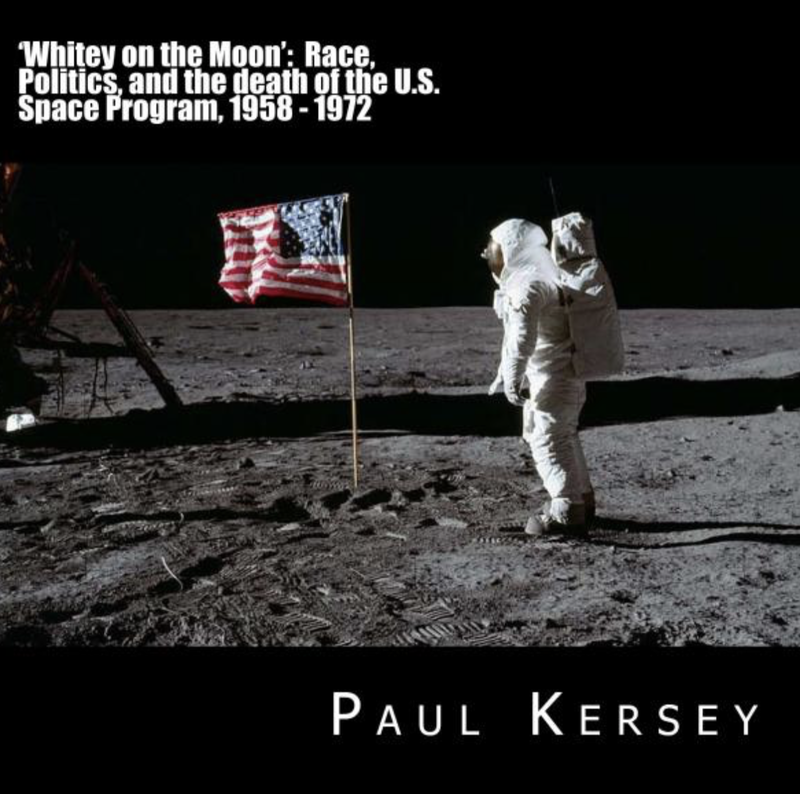 “F’ing blacks didn’t even have a calendar, a wheel or a numbering system until the Brits showed up.” He further alluded to pseudoscientific race science, which has found purchase in the mainstream right, spread by prominent conservative think tank figures like Charles Murray, who wields unjustified extrapolations from existing IQ data to argue against improving living standards for the poor. Ventre’s comments have kicked off a wave of anger and resignations across MUFON, most recently UFO researcher Dr. Chris Cogswell. Cogswell was named Director of Research for MUFON in January, but announced his resignation from the organization on Twitter in April. “When I first joined MUFON, taking on the Director of Research position, I believed this issue [with Ventre] had been dealt with,” Cogswell said. But on April 13, Cogswell learned of Ventre’s “continued role within MUFON as an active member” after Ventre emailed him about preparations for the 2018 MUFON Symposium in Cherry Hill, NJ. “Within six hours of finding out I had resigned. My internal conscience would not let me continue,” he said. MUFON boasts nearly 4,000 members and 500 investigators across a coalition of just-the-facts data collectors, alien abductees, far-thinking engineers, conspiracy theorists, ancient alien pseudohistorians, religious visionaries and ufology enthusiasts of every possible stripe. If MUFON is successful, who would the first aliens actually meet? An organization representative of the full spectrum of human experience, or a club of aging white men? It’s a question MUFON is currently struggling to answer, with Ventre’s post a crisis point in the organization’s ongoing evolution. Can we commence the search for signs of terrestrial life/intelligence? Kansas City Star asks: "Why Won't White People Murder Each Other at the Same Rate as Blacks in Missouri, Kansas and Wisconsin?" Crime-fighting advocates like Rosilyn Temple are at a loss to explain Missouri’s repeated designation as the state with the highest rate of black homicide victims in the country. And it’s not even close, according to 2015 data submitted to the Federal Bureau of Investigation. “I can’t figure why, I wish I could,” Temple, head of the local chapter of Mothers in Charge, told The Star. 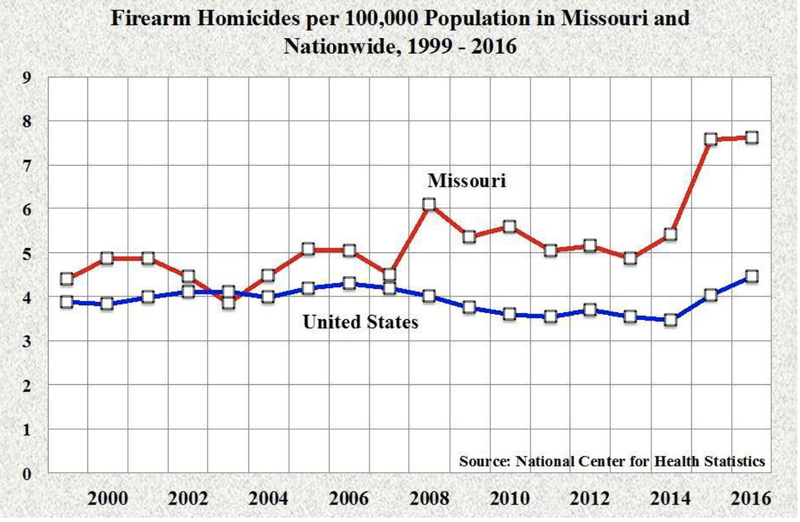 The Violence Policy Center reported this week that the rate of homicides among African Americans in Missouri was 46.24 per 100,000, nearly 2.5 times higher than the national average. Wisconsin recorded the second-highest rate of 36.77 per 100,000. Kansas had the ninth-highest rate of 25.02 per 100,000 African Americans. Nationwide, the black homicide rate was 18.68 per 100,000 in 2015. 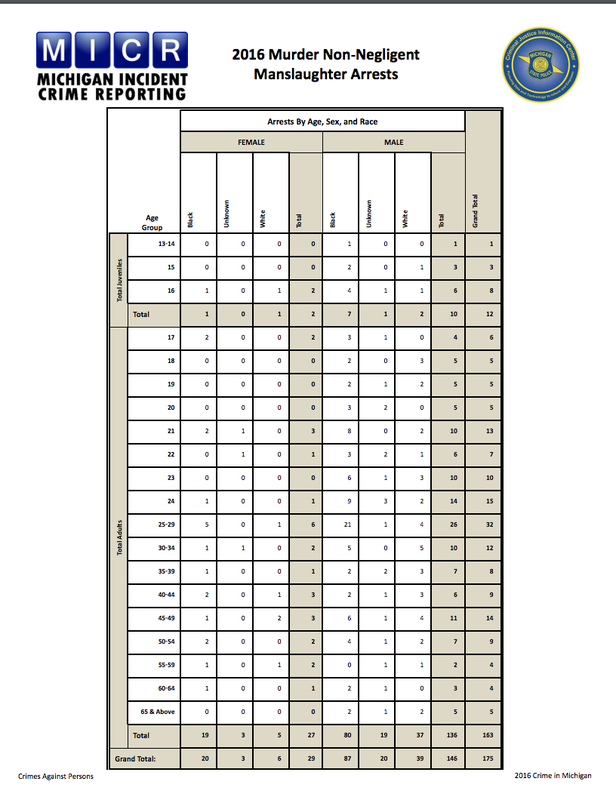 The overall homicide rate for all races was 4.62. The rate for whites was astonishingly low at 2.67. Missouri topped the rankings for the seventh time in 13 years. The state has been in the top five 11 times since 2004. Kansas has ranked in the top 10 three times. It’s a disturbing trend. 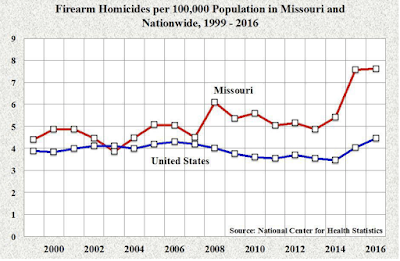 Kansas City Mayor Sly James laid some of the blame on Missouri’s lax gun laws.“Because of this, we’re fighting gun violence in our city with one hand tied behind our back,” James said. Officials say they are working to reduce the city’s homicide rate. But anti-crime programs such as KC Nova and Aim For Peace are not enough. Greater transparency and accountability are needed to improve cooperation between minorities and police. Access to quality jobs, education and health care is also crucial. The city recorded 150 homicides last year, the most in 24 years. Nearly 70 percent of homicide victims in 2017 and 59 percent of homicide victims so far in 2018 have been African American. Kansas City Police Chief Rick Smith said as the largest law enforcement agency in the state, the department is obligated to take leadership role in tackling this issue. The department is making strides to prevent violent crime, he said. “What we’ve been doing obviously was not making the needed impact,” Smith said. He added that cooperation starts with the assistance from the community to build trust. Residents must refuse to accept a culture of violence. Policymakers in Missouri and Kansas should partner on community policing efforts to address violence in the African-American community — and vow to get our two states out of the top 10 for black homicide rates. The TL:DR version of this story (a terse summation) in just one sentence: how can we convince white people to start killing each other at rates comparable to how blacks treat one another? PK Update: This needs to become a fundraiser for a number of incredibly important reasons. We need your help now more than ever to help SBPDL grow. Money order/PO Box information is listed below. SBPDL is ready. We are prepared to make a move to a site I've been quietly building to launch when the battle goes nuclear. 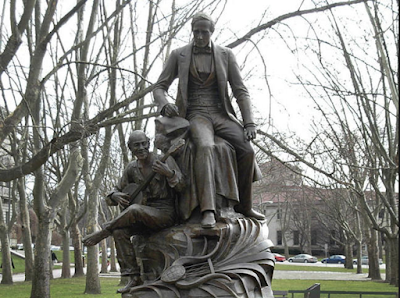 A 118-Year-Old Statue to Stephen Foster, a White Man, in Pittsburgh Removed Because of Cries of "Racism"
PITTSBURGH — A 118-year-old statue of the "Oh! Susanna" songwriter was removed from a Pittsburgh park Thursday after criticism that the work is demeaning because it includes a slave sitting at his feet, plucking a banjo. On Thursday, workers used straps and construction equipment to lift the 10-foot-bronze statue off its base. It was strapped to a flatbed truck and taken away.The Giuseppe Moretti statue was completed in 1900 and thousands attended its dedication. A statue honoring an African-American woman will be put up in its place. There's a metaphor in how Foster died and how the elite want all white people in America to pass away. The scientific method is nothing more than pattern recognition and adaptability of a hypothesis, which runs counter to the idea of the prevailing ideology of Black-Run America (BRA) - egalitarianism - which dictates racial equality. Baltimore in 2018 is proof the racists were right. But the PJ Media article doesn't help articulate just how stereotypically accurate the community found in 70 percent black Baltimore truly is when considered in the warnings of the so-called bigoted dogma of the white men whose statues are being removed in the city. Amid a surge in killings, Mayor Catherine E. Pugh walked West Baltimore streets Tuesday morning — a procession of police commanders and city agency representatives in tow — to see first hand the work of her Violence Reduction Initiative. The strategy floods targeted neighborhoods with services, with the aim of controlling crime. The mayor wanted to see how things were going and hear from residents she met along the way. But she also had a few points of her own to make. In a cramped convenience store on Pennsylvania Avenue, she peered into a booth where a cashier stood behind plexiglass. “What time do you-all close?” the mayor asked the man behind the counter. Asked about it after the mayor left, the man, who wouldn’t give his name, did not commit to closing the A&M Grocery any earlier. The crime reduction strategy began in November, and the mayor has credited it with the decline in violence the city experienced in the first three months of 2018. But in April, the bloodshed has surged again, with 29 killings in the past three weeks. Pugh acknowledged the uptick, which police say is largely driven by feuding gangs in West Baltimore. But she said her approach is nonetheless working. “We’re on top of it,” Pugh, a Democrat, said. “We understand the intelligence. We know about the various gangs that are at war right now. The mayor’s office stresses that violence is down overall from where it was at the same point last year, even as the pace has quickened in recent weeks. For the year, homicides are down almost 14 percent and non-fatal shootings are down 21 percent, according to the latest police data. But statistics are no balm for personal experience. Just ask Laverne Brown, a criminal clerk at the circuit court whom Pugh greeted on the steps of her Carey Street home. Brown said the violence — “at a peak now” — kept her in a job. The side streets were mostly empty in the area around Pennsylvania and North avenues, an area with a reputation for brazen drug dealing. William Boston, who runs the Will B Better Bodies gym, said if the police accompanying the mayor had not been there, the scene on the street would have been very different. Not that he was complaining. “They need to come and do this here every morning,” he said of the mayor and her entourage. 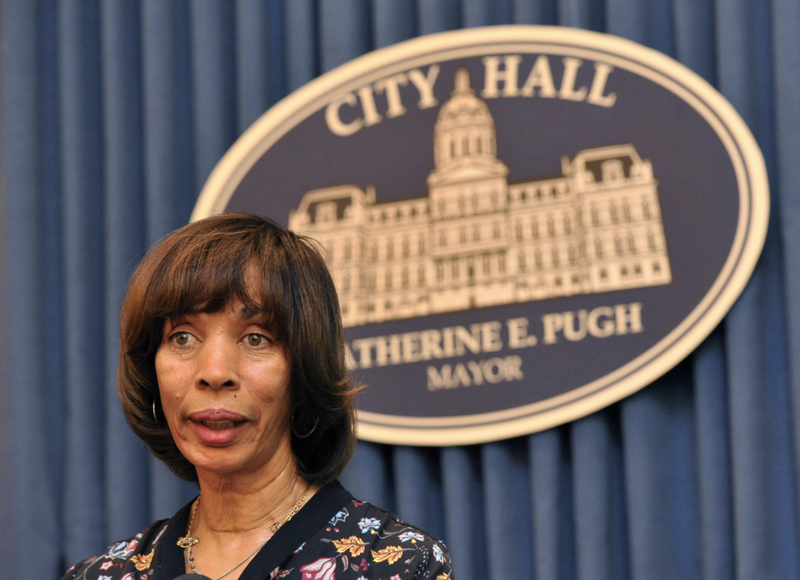 Yes, the black mayor of 70% black Baltimore just endorsed sundown laws as way to curb black crime/black dysfunction. The state of Baltimore in 2018 is proof of this verifiable fact (applying the scientific method, and we now know through extensive testing the hypothesis of egalitarianism/aracial thinking is discredited). Conclusions: the racists were right. 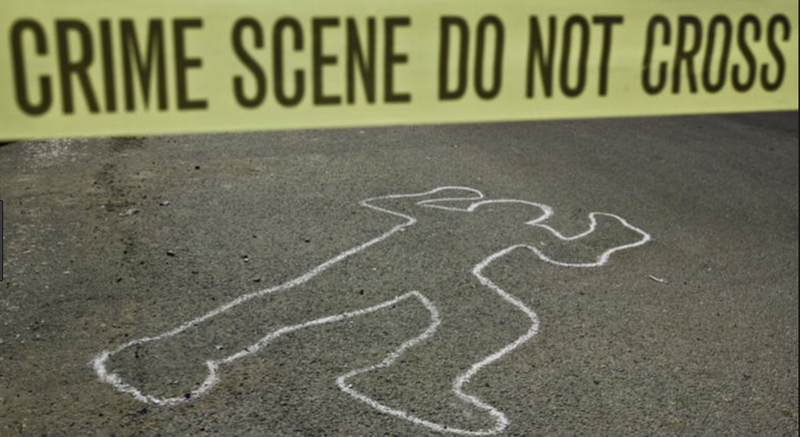 The homicide rates for blacks in Missouri is 46.24 per 100,000. 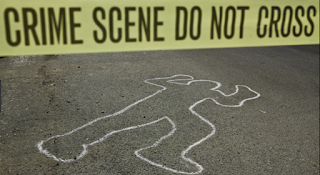 In St. Louis and Kansas City, Missouri, almost every homicide victim has a black suspect. 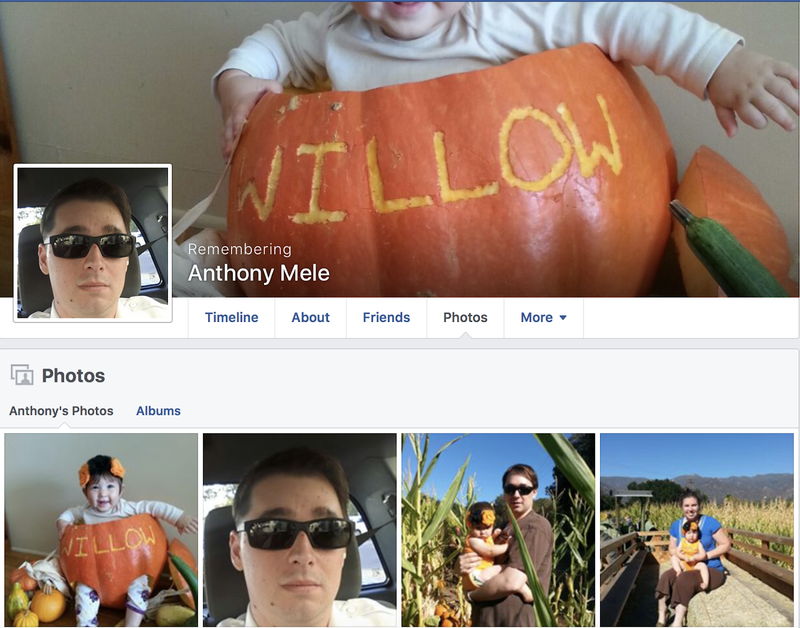 The anomaly in Missouri is a white homicide suspect. Without a black population, homicides would be an anomaly in the state of Missouri. Why can't the Violence Policy Center point this simple fact out in the data it collects, instead of creating new euphemisms for black crime/black dysfunction (again, "racial isolation" as the basis for black people killing one another means they are only civilized when living near whites)? The state of Michigan is roughly 76 percent white and 14 percent black. 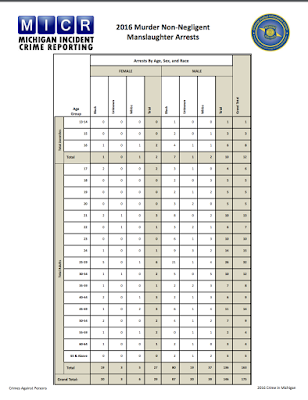 The state of Michigan puts out an incredible document entitled Michigan Incident Crime Reporting (MICR). Basically, the state has the racial makeup of roughly 1980 - 1990s America, just as the 1965 Immigration Act flooded the nation with nonwhites. But what's so stunning about this data is the color of crime in the state of Michigan it exposes, with cities such as Detroit, Pontiac, Flint, and Ann Arbor basically being war zones where black crime is driving away white civilization. Remember, blacks are only 14 percent of the population of Michigan, but were responsible for 61 percent of the homicides (of those homicides with a suspect). 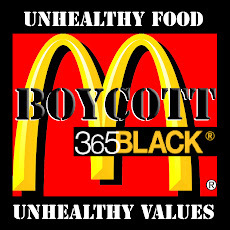 It should be noted the 83 percent black city of Detroit was responsible for 302 of the 586 homicides in 2016 (52 percent of the homicides in Michigan). For those interested, blacks were responsible for 70 percent of homicides in 2015. The white death vs. black dysfunction. The former is ignored by the elite and the media; the latter is the greatest crisis America faces, with trillions of dollars spent over the past half-century dedicated to uplifting black people and only black people. Which is one of the primary reasons for the white death. Suicide and homicide rates show strikingly different trends in the United States.The suicide rate has been increasing. It has been led by a rise in suicides in rural America, which are up 40% in 16 years. The homicide rate, on the other hand, has been decreasing over the same time period, though there has been a slight uptick in recent years. As shown, the overall, age-adjusted suicide rate in the U.S. is 13.5 per 100,000. The suicide rate (per 100,000) among whites (17.1) is more than 2.5 times the rate among blacks (6.3) and Hispanics (6.7). Were America to suddenly see all blacks disappear, the nation wouldn't have much of a homicide problem. Overall, the age-adjusted homicide rate was 6.2 per 100,000, a slight increase from 2015. In 2016, the homicide rate (per 100,000) for whites was 2.9, blacks 22.8, and Hispanics 5.3. Put another way, compared to whites, Hispanics were roughly twice as likely and blacks eight times as likely to be murdered. The contrast between races is further underscored by creating a "suicide-to-homicide" rate ratio (or vice versa). For whites, there are roughly 6 suicides for every 1 homicide; among blacks, there are about 3.5 homicides for each suicide; and the rate ratio among Hispanics is roughly 1:1, with suicide slightly edging out homicide. 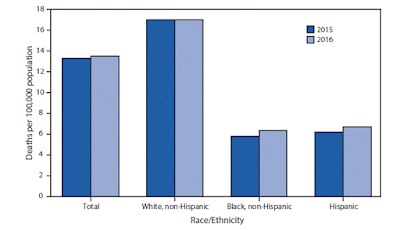 Source #1: "QuickStats: Age-Adjusted Suicide Rates,by Race/Ethnicity — National Vital Statistics System, United States, 2015–2016." MMWR 67(14): 433. Published: 13-Apr-2018. DOI: 10.15585/mmwr.mm6714a6. Source #2: QuickStats: Age-Adjusted Homicide Rates, by Race/Ethnicity — National Vital Statistics System, United States, 2015–2016. MMWR 67(15): 462. Published online: 20-Apr-2018. DOI: 10.15585/mmwr.mm6715a8. Until we stand up, we'll just keep falling down. Jackson was initially booked in the Ventura County Jail on attempted murder charges, according to inmate records. However, those charges were since upgraded to murder and child endangerment. He is being held on $500,000 bail. Only we can make them matter again. No one is coming save us. Baltimore’s police commissioner addressed a crowd at a hip-hop concert alongside the mayor, but the audience didn’t seem interested in what he had to say. 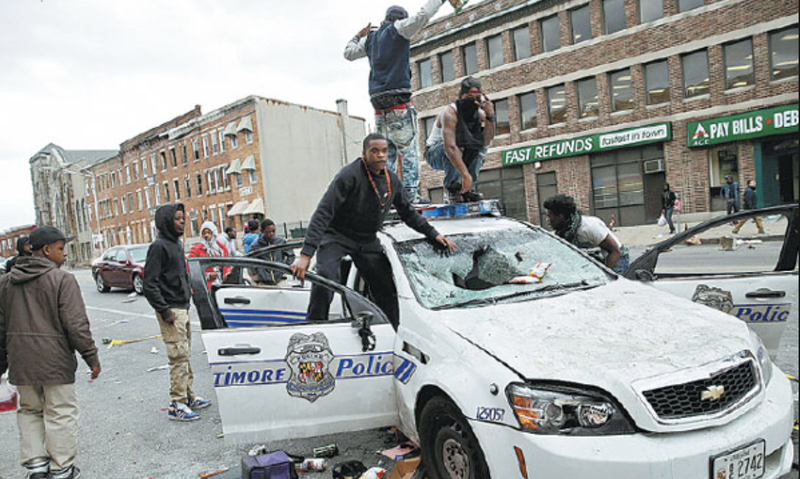 Western civilization had a good run in Baltimore. The commissioner went on to say he promises changes will be made to policing in the future. The Baltimore Police Department has been under fire for reports of abuse of overtime pay, a federal racketeering investigation and a federal order to overhaul the department’s policies and practices. Baltimore has also seen a surge in violence over the past few weeks after a decline to start the new year. If you've read The City that Bleeds: Race, History, and the Death of Baltimore, you know black people in Baltimore carefully protect their city by using black criminality to keep out white people from ever being a demographic threat to run things again. You'll also know that in 1917, Baltimore was 88% white. Restrictive covenants and segregation kept city prosperous and safe from the very population now representing 70% of the city's population, with the white population below 25 percent. Again, in 1917, Baltimore was 88% white. Restrictive covenants and segregation kept city prosperous and safe from the very population now representing 70% of the city's population. In 2018 Baltimore, a 70 percent black city governed by democratically elected black officials, we are on the verge of seeing a black police commissioner unofficially hand the city over to the criminals. As stated: Can we just make it illegal to arrest black people in the United States of America? What does these four men have in common? All were white men who served the United States Military in World War II. All were white men who were murdered by black people in the last eight years. Myrtle Ryan is Greaves closest living relative. She had the grim task of identifying her cousin -- a man she describes as a private and kind person. "It’s sad," she said. "You work your entire life, you retire and have to have something like that happen." She says the former body builder, who was a World War II veteran serving as a Seabee in the Navy, was anything but frail -- even at age 87. She’s convinced he would have fought back and it appeared his killers got away with no money. "They didn’t get in the house apparently because the wallet was there, and the keys to the car were there, and yet the door was open… it wasn’t open, but it was unlocked," Ryan said. His home was located 12 miles from 1801 Spruce Street, the Philadelphia address where two black males were arrested for loitering in a Starbuck's and failing to cooperate with police nearly eight years later. Two teenagers were charged in connection with the murder of an 87-year-old Cedarbrook man earlier this week. Philadelphia homicide detectives say a 17-year-old girl and 14-year-old boy confessed to killing George Greaves outside his home on Wednesday. 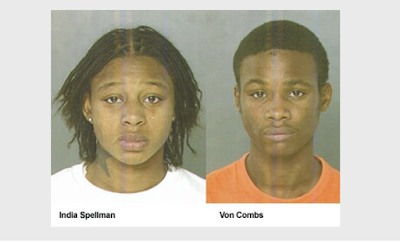 Police sources tell NBC Philadelphia's Monique Braxton the pair gave statements confessing to the crime on Friday night. Investigators say the girl pulled the trigger and told police she used her grandfather's handgun in the fatal shooting. But the suspect's grandfather told Braxton his granddaughter did not use his handgun in the shooting. He said she was picked up by police at his home. He also says the 17-year-old is a student at Martin Luther King, Jr. High School and has never been in trouble with the law before. NBC Philadelphia is not releasing the grandfather's name because police have not released the name of the 17-year-old suspect. Police say the teen suspects live just a few blocks away from Greaves and said they planned to rob him. Investigators also say the suspects told police they snatched a ladies purse not far from Greaves' home. Greaves was found with a bullet through his chest in his driveway on the 7900 block of Pickering Street Wednesday afternoon. Witnesses say they saw a woman wearing a Muslim headscarf and a man in a black shirt and shorts run from Greaves' house shortly after hearing shots fired. 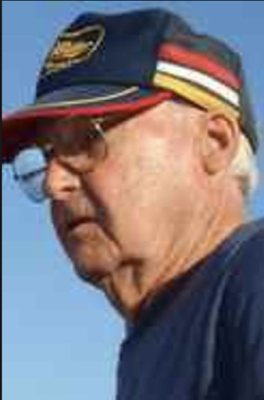 Neighbors say Greaves, who many knew by his nickname, “Bud” was living out his golden years and enjoying life. Some say the arrests bring a sense of relief. "My 5-year-old didn't want to come outside. Everyone was staying in..some people didn't want to go to work," Denyse Morgan said. Greaves was a World War II veteran and Navy Seabee. Five white World War II veterans murdered by blacks in the past eight years. 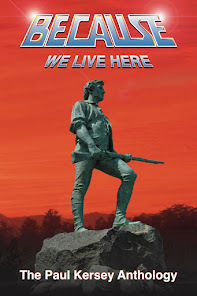 What was it they fought to preserve again?